Games developers love a bit of survivalism. We’ve helped solo protagonists endure dangerous asylums. We’ve guided grizzled duos through zombie apocalypses. We’ve even kept entire households alive in more pedestrian fashion. But Thea: The Awakening takes a very different approach to the whole concept, casting you as a god who must preserve their existence (and their power) by keeping a settlement of villagers alive. But as you’ll discover if you pick up this unusual curio, there’s far more than population management at play here. In a nutshell, that is Thea: The Awakening’s greatest strength. A hybrid of many genres all somehow sharing the same space. And, in true cliched form, it’s also its biggest downfall. When you begin, you can choose from eight different deities, each one with their own specific type of followers and traits they pass onto their acolytes. Mokosh is a goddess of nature, so her people are habitual gatherers and benefit from a series of bonuses as you level her up (such as gathering at a faster rate). While only two are accessible at the start, their base stats do facilitate some very different playthroughs. When you’ve chosen your holy form, you soon encounter the sheer number of ideas developer MuHa Games has crammed in here. There are no heroes to be found, no armies to build and unleash. There’s a malevolent force called The Darkness (because being a vague antagonist means you’re almost always called The Darkness), but you’re not going to march off to its gates and give it what-for, Total War-style. You’re just regular folk living a Medieval world inspired by Slavic mythology. It’s a fresh approach, and one that plays directly into the sense of perpetual danger your people are perpetually facing. Everything is turn-based, so you only have a set number of actions you can perform per turn. You’ll need to send out villagers to gather resources, or search nearby ruins for secrets and treasure. 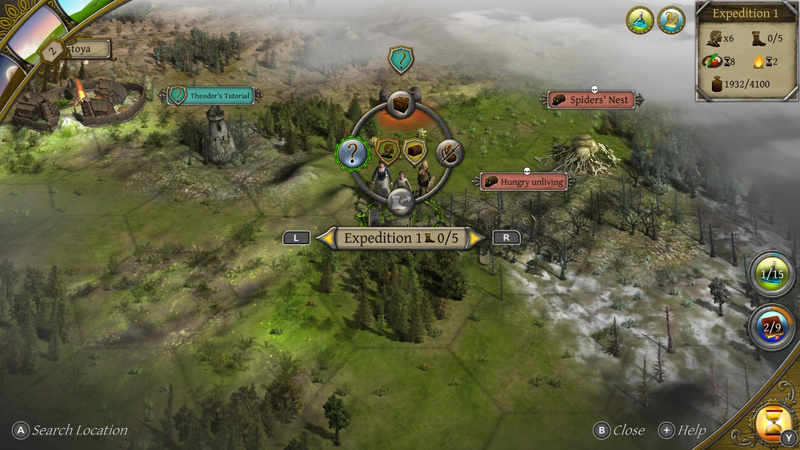 There’s a 4X, Civilization empire management aspect where you’re juggling a rolling story about the world emerging from an age of terror as the gods slowly make their return while turning your settlement into a far sturdier hub of life. You’ll need to make sure every villager is well fed and suitably healed, assigning items and jobs as you go. While the busywork of having to micromanage every single member of your community does start to get very repetitive after a while, the randomness of its storytelling does help add some unexpected spice. 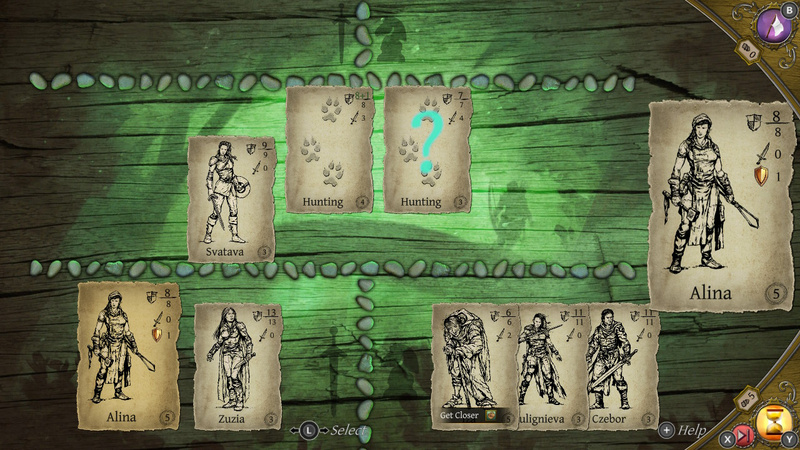 These encounters are card-based, similar in presentation and format to the scenarios of Hand of Fate 2, where you’ll ‘choose your own adventure’ in both peaceful and rather more dangerous missions. One second you're exploring some ruins only to encounter some haunted skeletons, the next you’re having a chat with a friendly mole. Those card-based mini-games certainly look the part, but much like every other part of Thea: The Awakening, they’re over-complicated to the point that you’re much more likely to auto-complete an encounter than be faced with deck-based affair that should be fun first and foremost. Perhaps it’s a conscious decision to tap back into the ‘survival’ aspect of the game, but it just comes off as unintuitive at best. The problem Thea: The Awakening has is the meat of its gameplay becomes repetitive very quickly. Even with a small village, you’ll need to make sure every settler is out gathering food, fuel or fighting monsters. Every one of them uses up both resources so you’re constantly assigning items and sending them off to complete the same tasks. The survival element soon goes out the window as actual dangers are resigned to narrated encounters and card-based combat. It’s the first time you realise that this is a game that’s simply trying to be too many things at once. Usually, with a Civ-style 4X game, the real joy is in building up your lowly village into a bustling metropolis. The problem is Thea: The Awakening bottlenecks progress by making the most important resources unnecessarily difficult to acquire. 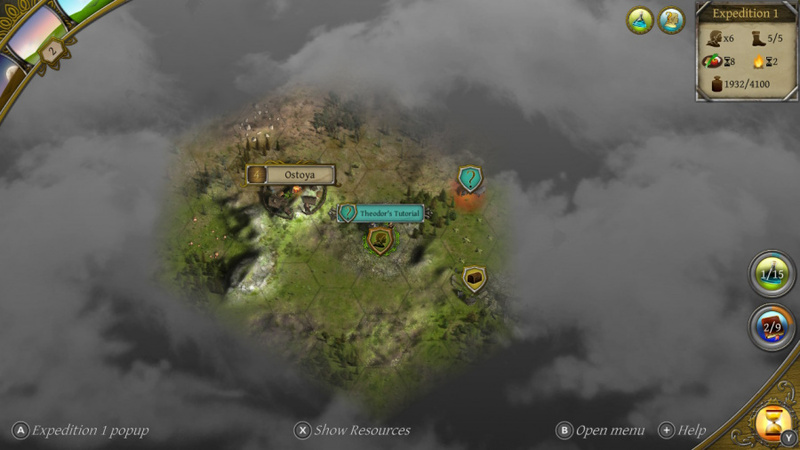 There’s a deep and vast crafting system in place, which uses the resources you gather from searching, combat and diplomatic encounters to create everything from armour for your warriors to new buildings and structures. The problem is, even on the lowest difficulty settings, you rarely have enough at your disposal to build anything of worth. The game simply gets stuck in a rut of its own making, and rarely finds a way out. Thea: The Awakening wants to be many things. It wants to be a proper 4X game; it wants to be a through-and-through survival experience; it wants to be an RPG, a CCG and many other genres all at once. It succeeds at some, but often at the expense of others. There are some really great ideas here – the almost Pratchett-esque silliness to some of its scenarios and the focus on Slavic myths serves as a striking source of inspiration – but the focus on micro-management busywork simply gets in the way of the empire-building fun Thea should really be embracing. That's a shame to hear, after playing Civ VI and Armello I was looking for some more 4X experience, guess I will get Wargroove instead or wait to see if Romance of the three kingdoms hits these shores. This looks like one of those boring games that is hard to get into. So it just needed an little more focus. I guess if you came from the D&D of the past it doesn't looks that bad. It's not a Grinding-mashing your controller. If it comes in Physical I might give it a go. No more eShop would ya...common. Watch the live review-it's not bad. This game has a 9/10 on Steam user reviews and is rather highly regarded so I’d take this review with a grain of salt. Feels like the author didn't really bother learning the mechanics of the game. Sad, and a poor review. The card game is not that complicated. It's all right to left actions. I have been enjoying this game tons. Sounds like the kind of thing I might like, but between Civ VI and Hand of Fate 2 I think I'm set for a while, and Armello and Slay the Spire are already ahead of it in the "want to try" queue. I am conflicted with this review. I will have to dig into reviews deeper elsewhere just to be sure. Sounds like Nintendolife should have given it an eight out of ten. Fall of light now this? Yeah I agree with what some others have already said, this reviewer didn’t do enough work on this in my eyes, it has good reviews elsewhere and I have been enjoying it very much. This is the second review in as many days on Nintendo Life (with yesterday's Tangledeep review) where the reviewer seems to dock the game points for being "too deep" and having too many systems in play. Having played both, I can tell you they're not more or less deep or complicated than other (computer) games in their genres. Perhaps there needs to be some diversity in the Nintendo Life review team to account for games with deeper systems, and don't just palm these sorts of games off to reviewers who like "pick up and play" arcade experiences. You wouldn't give the FIFA review to someone who doesn't understand football or like sports, for example. Looks interesting from the videos I’ve seen. Might end up getting this eventually. Though I’m not exactly short of games to play atm. I think the review was already biased in the review was looking for some kinda grinding RPG rather then a diverse gaming experience is what I get from reading it. And if you see the video online is is immersive in itself. If one hasn't played the games like "Myth" then one doesn't know what they are missing. Games don't have to be Grinding RPG or Controller Mashing to death games to have high marks. And that is what is missed here trying to use a Grinding mindset to a Strategy game play missed all the marks. And just from watching the YT the controller function will be challenge to see how it works. I'll just role play in Civ 6 that Germany and the Aztecs are demon civilizations. Since they are always the most antagonistic. @Retron Same reviewer... so you can see how the reviews are similarly skewed.